In a heavy sauce pan set over medium heat, bring the half & half and salt up to 180 degrees. Meanwhile, beat the egg yolks with the sugar until pale yellow and fluffy. Remove the sauce pan from the heat. Whisking constantly, add 1/2 cup of the hot half and half to the egg yolks, then add the egg yolk mixture back in the sauce pan whisking constantly. Place the sauce pan back on medium heat and whisk constantly until the mixture thickens considerably, for about 3 minutes. Strain the mixture in to a bowl set in an ice bath. Stir every now and then until cooled to room temperature. Whisk in the olive oil and vanilla. Refrigerate the custard until chilled, preferably overnight. Process the custard based on your ice cream machine's instructions. 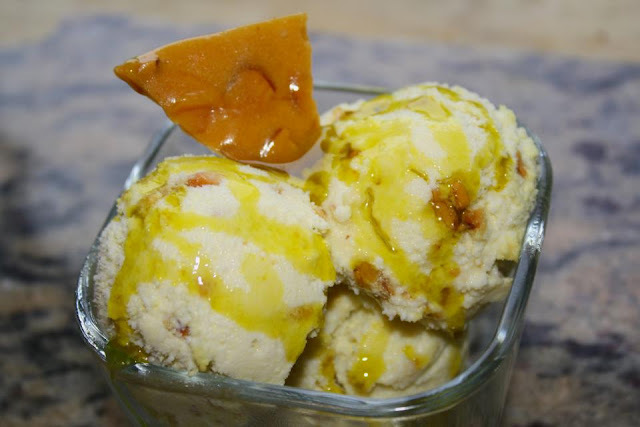 If adding the almond brittle to the ice cream, add coarsely chopped brittle to ice cream during the last few minutes of churing. Grease two large baking sheets. Place the sugar and water in a heavy 5+ quart stock pot fitted with a candy or deep fry thermometer. Stir the sugar, water and salt to evenly distribute. Over low heat, stir to dissolve the sugar in the water until no granules remain. Turn up the heat to medium-high and bring the syrup to a boil. Add the butter and almond oil and almonds. Continue cooking stirring constantly until the thermometer reaches 300 degrees. Immediately remove from heat and stir in the baking soda and vanilla extract vigorously. Pour the hot brittle on to the prepared baking sheets, dividing equally. With a greased spatula or two greased spoons, carefully stretch the hot brittle as thin as possible. Allow to cool completely and break in to pieces. Makes about 1 3/4 pounds of brittle.